Here's a little section of my bookshelf that I call "oversized books" just cause most of them are too big to be placed vertically and therefore must be stacked. My Petite Night Flower Blythe doll Peony hangs out here too. I collect photography volumes that I like to study and also have an admitted propensity for fashion and design books as well. I was fortunate enough to be gifted six of the books here. I love receiving pretty books as gifts. So do we own any of the same ones? What kind of books are on your bookshelf? Oh yes, we own some of the same books and some of yours are on my wish list. Most of the books on my bookshelf are picture-heavy design books lol. I have to admit I'm not the biggest reader - but you have some very interesting books in your collection! Hello there! Thank you dropping by blog and commenting. i love receiving pretty books as gifts as well. You have such a lovely collection! I really need to get more physical books (we just have Kindle books and paperbacks). Tim Walker pictures would be amazing! Since we moved to NYC and a tiny one bedroom apartment I've (sadly) done away with real books and am sticking to the electronic version... which just does not work for the fabulous books that you have. The Chanel and McQueen books look especially good - I have an official case of book envy! ps. thanks for your last comment - it made me laugh out loud! your book shelf makes me happy. i wish that was my bookshelf! Oh wow! so many great reads! I have the Domino book which is nice but none of the others. I saw the McQueen book last week and it has some stunning work in it. I have a ton of books so I don't buy too many new ones these days. We don't share any of the same!! Mine mostly consists of: Maya Angelou, Harry Potter, and "The Girl With The Dragon Tattoo" series at the moment. Great books on yours! Love the cute little doll! Love this peek! We both have the Tim Walker and Alexander McQueen book, but many of your others are on my wish list. And I love your petite Blythe!!! I'd love the Chanel book!! 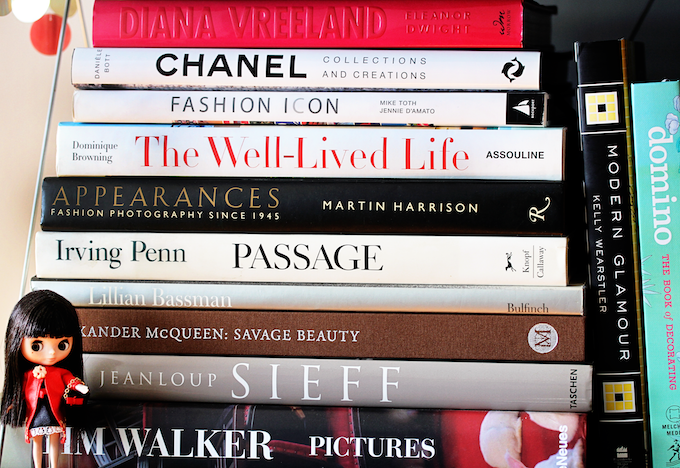 You sure have some interesting fashionbooks on your shelf! Love the Petite Blythe in the corner :] I don't own any of these, but I would love to look through them all. The Chanel and Alexander McQueen ones especially. Wow it looks like you have an awesome collection of books!! I wish my bookshelf looked as cool as yours!! Thanks for your kind b-day wishes hun! This is a fantastic collection of books! I actually don't have any bookshelves in my place..yes this is bad! And the cute little peony is soooo cute :) SSH is too busy with his restaurant business and whatever else he is working on. He is soooo hot :D I am looking forward to this post! Wow! Great collection of books. The Chanel book really caught my eye! need to check it out. Yes, yes, and YES!!! Everything a fashionable gal should have...a little art...a little fashion...a little interior design...honey, you've got it all! What's next on your hitlist?? I'm really intrigued by "Appearances" by Martin Harrison! That's a really nice collection you've got there! On my bookshelf I've got "Pretty- The Nylon Book of Beauty" and lots of Paulo Coelho, he's my favourite writer. And I'm currently reading Freud's Dream Psychology. 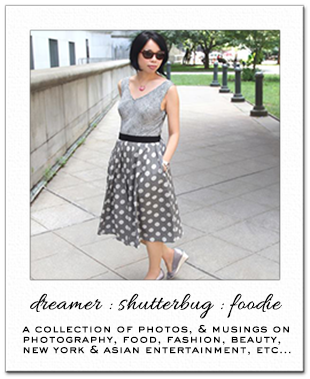 Thank you for stopping by my blog, yours is great and I'm now following :) Keep in touch! That's a fabulous collection of fashion books, I actually don't own any of them! Must work at building up a collection. Thanks for stopping by Fluff and Fripperies, maybe we can follow each other? Wow, I can just imagine the lovely pictures in all those books! You have quite a collection! I love your little Blythe sitting there in the corner as well, too cute! I love your Blythe doll so much! I wish I could find them in the states. Thats a very inspiring bookshelf! I´m such a sucker for this type of books! Love your collection! Oh I wish! Those are fab. I have a lot of biographies. :( Great collection. Stacking larger size books is best. I'm crazy about books, I even buy vintage ones, but I don't own any of these here...I too often get books as gifts and I love it!